Apple World Today readers are no doubt familiar with Pad & Quill, one of our early sponsors and the artisans that design and make a variety of classy leather Apple accessories. The latest from the Minnesota design shop is the Heritage Leather iPad Pro 10.5" Case (US$139.95), a thin and lightweight folio leather case that's perfect for protecting the 10.5-inch iPad Pro. What attracted me first to the Heritage Leather Case was the size. 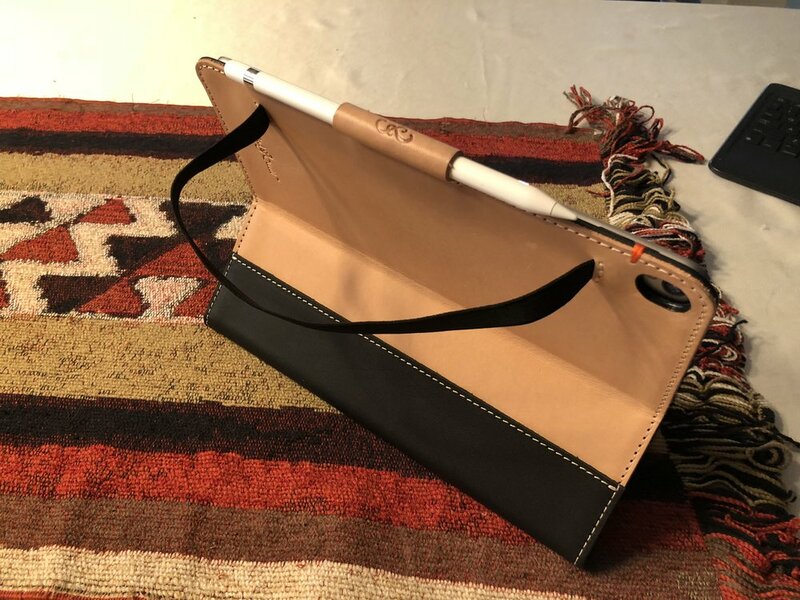 Pad & Quill realized early on that not everyone wanted a thick leather iPad case, and they did something innovative to get rid of the need for a plastic or wood "tray" to hold the iPad. That something? Partnering with another Minnesota company -- 3M -- on a sticky but removable adhesive that could be used to attach a case to an Apple device. The Heritage Leather Case is designed with two colors of leather; one is a vegetable-tanned natural leather that gains a patina with age, with a Chocolate (brown) or Galloper Black leather spine. The inside of the case is a black Charcoal leather, with the side opposite of the iPad Pro set up with a document pocket. An elastic closure holds everything closed when in transit, and there's a leather loop to hold an Apple Pencil in place. Two distinctive touches you'll find on most Pad & Quill cases are apparent on the Heritage Leather Case: a small signature of the artisan who made the case, and an orange stitch or two that honors WorldVision.org. Installing the iPad Pro "in" the Heritage Leather Case is simple: clean off the back of the iPad Pro, peel off the paper backing on two adhesive strips, align the iPad Pro's camera with the cutout on the back of the case, and push it onto the adhesive strips. Done! The Heritage Leather Case works with Apple's Smart Keyboard for iPad Pro 10.5-inch, so if you want to use the keyboard while keeping your iPad Pro protected with class, you can. As a natural material, the leather gains a patina with age and use, and Pad & Quill provides a 1 ounce container of leather balm to enhance the patina process. Pad & Quill continues to impress and amaze me with its commitment to products to protect and beautify your Apple devices. The Heritage Leather iPad Pro 10.5" Case is a perfect example of functional design and skilled artisans coming together to make a beautiful protective product.